Are you an e-mail pack-rat like me? If you were to peer into my copy of Apple’s Mail, you’d see more than 15,000 messages filed away for who-knows-what future purpose. Still, I can’t bring myself to delete them, just in case. Who knows when I might need something from that folder of messages from every user who registered for my long-since-vanished e-book on Mac OS X 10.1? Or when a critical piece of information might turn up in the folder containing nothing but press releases from all the way back to 2002? In previous versions of OS X, it wasn’t a problem having all this data stuffed in my mail folders. 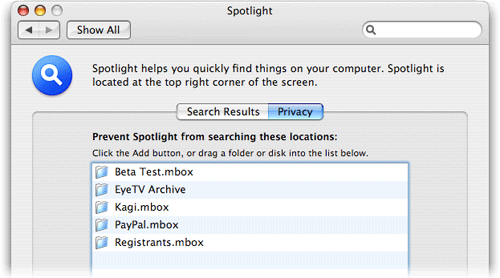 But with the release of version 10.4, Spotlight entered the picture. Left to its own devices, Spotlight will index every e-mail message you receive and keep. For me, this meant that Spotlight searches would often return tons of irrelevant matches from messages in my “background info” folders. I didn’t want to ditch these, but it sure would be convenient to hide them from Spotlight. If necessary, navigate into the folders within the Mailboxes folder to reach sub-folders. When you’re done, close the Spotlight panel, and that’s that. If you ever decide you want Spotlight to include a certain folder again, just return to the Privacy tab, select the folder, and hit the minus sign to remove it. As soon as you do so, Spotlight will update its index to include all the messages within.